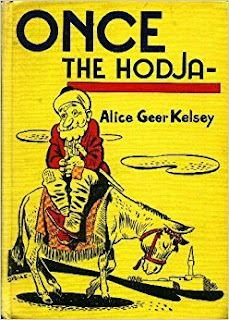 Today's information about the Hodja will be great if you want to find more stories on your own, but otherwise you won't find any stories here. I do however give you the means to get to some and they even are categorized into six topics. In my "The Hodja Still Lives! - Part 2" I said today's information would come from Erol Beyman's site, which now can only be found on the Wayback Machine (part of Archive.org). That link takes you back to July 6, 2004. I am omitting the PREFACE, INTRODUCTION, GRAPHICS, and LIFE STORY you will find there as I think it's information I've already covered or, in the case of the Graphics, it's difficult to download. TRAINING has Reading Exercises with 6 stories (Nasreddin and the Pot; Nasreddin Goes Shopping; Nasreddin and the Beggar; Nasreddin and the Smell of Soup; Nasreddin the Ferry Man; Nasreddin's Visitiors). Each checks for Reading Comprehension; Recreating the Story; and Summarizing the Story: Gap-fill Exercise. There's also a section on Learning Exercises with the the story of Nasreddin and the Candles, but I'm told the Java Applets tend to crash browsers, so I didn't try that section. Instead I bring you Beyman's SOURCES and LINKS. If you click on STORIES there's a 6-pronged graphic grouping the stories into categories of Family Troubles; Neighborhood; Town Conversations; Animal; Business Life; World Questions. Sir Valentine Chirol, Translated by Henry D. Barnham, C.M.G. Next week I promise you will bring a devil of a story .